When Terence Kearey married for the first time in 1957 Britain was still recovering from the war years, and had further to go than anyone suspected. In the author’s case, the economic pressures were exacerbated by a family which was expanding much faster than he had intended or could afford. The result was an economic and emotional downward spiral which ultimately led to the greatest crisis of his life. Finding himself fighting an emotional battle at home and an industrial one at work as he was caught up in the greed, selfishness and restrictive practices of post-war industry, he came near to emotional and financial collapse. In the 1980s, helped by friends, family and good fortune he managed to recover, remarry and rebuild his life. After adventures in Spain and England during which new friendships were forged and old hostilities buried, the author finally found peace at last. This is the story of those years. 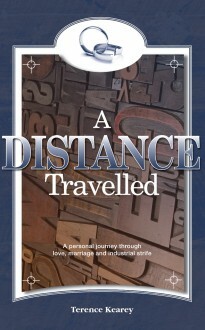 A Distance Travelled is the fourth in a quartet of books by Terence Kearey dealing with aspects of life in Britain through the centuries from the perspective of his own family. The others are History, Heroism and Home, A Changing World and Country Ways. The author is working on a screenplay based on the first three books and a definitive account of the Gommecourt Diversion discussed in History, Heroism and Home.